A quick look in a new direction-I made this piece this weekend. I had a ton of orders and work to do but needed a creative break. So I grabbed a piece of bark from the garage and went to town with some new flower forms. The rose in the middle started life out last week as a little bird's nest but I liked the look of the form so much I kept it as is (there's a close up if you scroll down a bit). Lately all my creative dreaming has centered on two ideas. The first is a constructed piece. I want to continue to develop my construction skills. It started out with the birdhouse assemblage I demo'd for you all a few months ago. But now I'm thinking of framing the wood all around and using a teal crackle medium to coat. Maybe with a cream on top- or below. Haven't decided yet. But then I want to wire on some more flowers. And here's the revolutionary part- I'm thinking of painting my wire. Not with a spray- hate that look but by hand with some metal compatible paints. I just have such a yearning for color lately. We'll see. Soo stay tuned on that one! Now that I know you're riveted I'll let you in on the other idea as well. I've been playing around with clay and wire pendants (see Paris- a few posts ago) and want to start sewing into the clay. Maybe wiring elements like buttons or beads. I've just got a strong feeling it could really develop into something I love. Part of the art of art I think is to continue to develop as artists. Sometimes that might mean just learning a new technique. Sometimes that entails a complete shift into a new direction. But for me, right now, my art is branching. I'm continuing to stick with some of the images I love but starting to use them in different ways. I can't wait to see where this all leads. Hopefully you all will stay tuned and help me along the way with your comments. I really appreciate knowing when something you see here on the blog strikes a chord. Or if you'd like to see more something. Thanks again to all of you who have stopped by and have commented on my work. I love getting the reaction of others to what I do! The composition of this peice is perfection to me. Each element is just as it should be. I am thrilled to hear you are considering more color - I love the fabric you add already and the clay pieces you've worked with lately have been really fun. I"m on the edge of my seat to see what else you come up with. 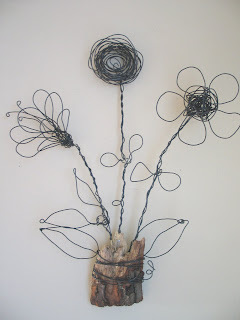 I LOVE those wire flowers!!! That is so my style! Ooo, can't wait to see more! Thanks girls! I VERY much appreciate your comments!!! Have a great Easter weekend!